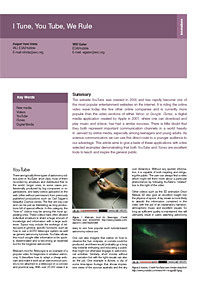 The website YouTube was created in 2005 and has rapidly become one of the most popular entertainment websites on the internet. It is riding the online video wave today like few other online companies and is currently more popular than the video sections of either Yahoo or Google. iTunes, a digital media application created by Apple in 2001, where one can download and play music and videos, has had a similar success. There is little doubt that they both represent important communication channels in a world heavily influenced by online media, especially among teenagers and young adults. As science communicators we can use this direct route to a younger audience to our advantage. This article aims to give a taste of these applications with a few selected examples demonstrating that both YouTube and iTunes are excellent tools to teach and inspire the general public.